Some things just go together like peanut butter & jelly or bread & butter. And now, even if you’re eating gluten-free, you can bake bread and eat it, too. 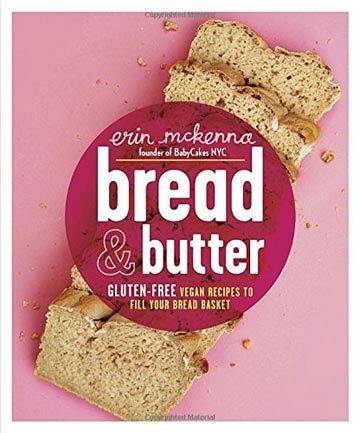 Erin McKenna, founder of BabyCakes bakery, has cracked the code to making flaky, light and tender breads that are gluten free (and vegan!). On the pages of Bread & Butter, she shares recipes for baked goods such as English Muffins, Pizza Dough, Sandwich Bread, and Puff Pastry Dough. Plus, there’s a vegan butter recipe that tops the baked goods perfectly and will knock your socks off. Check out our Gluten-Free Slideshow for more recipes that go together like milk & cookies. NO PURCHASE NECESSARY TO ENTER OR WIN. Void where prohibited by law. Open to legal residents of the 50 U.S., D.C. and Canada (excluding Quebec) who are at least eighteen years old at the time of entry and have internet access. Begins on 3.25.19 at 12:00:00 a.m. ET and ends on 4.15.19 at 11:59:59 p.m. ET. To enter this giveaway, submit your full name and email address on this form. Odds of winning this giveaway depend on the total number of eligible entries received. Only one (1) entry per email address per day. Sponsored by Leite’s Culinaria, Inc. For more information, visit our Official Rules. For a list of winners, check out our Very Happy Winners page. Be sure to add giveaways@leitesculinaria.com to ensure notification if you are the winner.